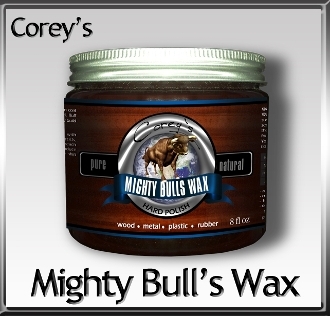 We are so proud to offer you Corey’s Mighty Bulls Wax. Finally, a superb, non-toxic, non-flamable, sustainable wax with no breathing hazards. The secret is simple, we just use the best ingredients in the world to begin with. It has been developed for professionals who demand exquisite results. You truly will be amazed with the simple application, fast drying, and the huge coverage area. WOOD: furniture, polish, butchers, blocks, bowls, paddloes, oars, brightwork. METAL: cast machine tops, auminum, brass, copper, chrome, bronze, steel. PLASTIC: helmets, surfboards, snow machines, counter tops, skid's, sled's. AUTO: car wax, dashboards, vinil seats, tires, rims, vinil tops, running boards.